In 2012, the average cost of a law school education was $40,500 for a private university and $23,600 for a public one. Multiply that by the at least the three years it takes to complete law school, and one could spend more than $70,000 pursuing that degree. 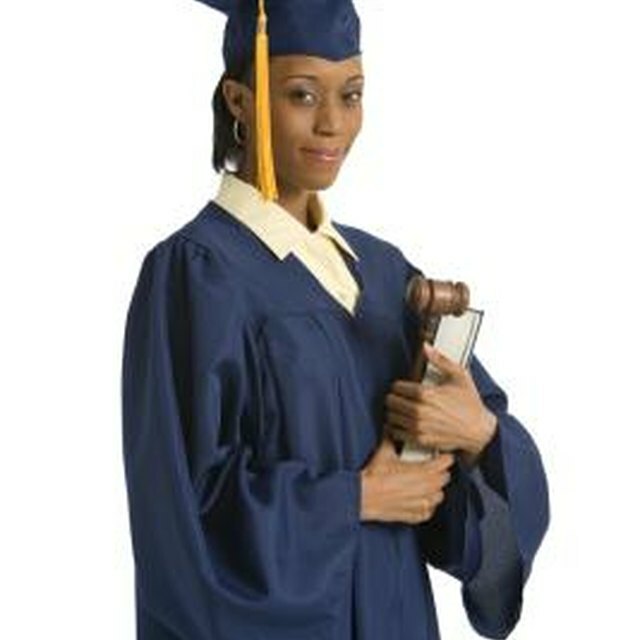 It is estimated that 90 percent of law students finance their education by taking on debt. It makes sense that individuals interested in attending law school pursue scholarships to decrease the money they have to pay or pay back. Merit-Based scholarships are offered by law schools to applicants who demonstrate academic ability typically evidenced by a GPA or a score on the Law School Admissions Test (commonly referred to as LSAT). Most law schools offer such scholarships, though they typically are limited in number and very competitive. For example, Duke University School of Law offers only one merit-based scholarship, the Samuel Fox Mordecai Scholarship. These types of scholarships vary in the amount awarded but can cover up to full tuition, fees and books. Law school admissions offices and related websites will describe the criteria for receiving those scholarships and how to apply. Because these types are limited in number and highly competitive, it is best to apply early. Other merit scholarships may be awarded through participation in mock trial or moot court competitions sponsored by law schools. For those awards, no particular application is necessary since they are awarded to the teams that win the competitions. Need-Based scholarships are offered by law schools to applicants who demonstrate a financial hardship or difficulty financing the education. These scholarships are less common because most schools expect that students will finance their education through loans. In order to be eligible for need-based scholarships, applicants are typically required to submit their Federal Application for Student Aid, or FAFSA. The amounts awarded vary. Like merit-based scholarships, these are limited in number, so those who qualify should definitely apply early. Public Interest scholarships are awarded to law students who have demonstrated a desire to serve in the public sector, such as serving as a lawyer for a government entity, representing a nonprofit organization, clerking for a judge or providing legal representation to indigent clients. For example, New York University Law School offers the Root-Tilden-Kern Public Interest Scholarships to students in exchange for a commitment to pursue employment in the public sector after law school. Twenty students are awarded full tuition and are selected based upon their commitment to public service, academic excellence and leadership potential. Other public interest scholarships, like ones awarded by Valparaiso University Law School, provide stipends to encourage law students to take unpaid summer internships in the public sector. Application and criteria for either type of public interest scholarship vary depending on the law school’s requirements. When Should High School Students Start Applying for Scholarships? Diversity scholarships are typically offered to applicants who are traditionally underrepresented in the legal profession. These types of scholarships are offered both by law schools and external sources. Criteria and application procedures vary from scholarship to scholarship. For example, the American Bar Association, through its ABA Legal Opportunity Scholarship Fund, offers $15,000 scholarships to 20 racially and ethnically diverse students annually toward the cost of their legal education. Beyond being diverse, the majority of the scholarship recipients demonstrated a commitment to public service either prior to, during or after law school. To be considered, applicants should submit transcripts, letters of recommendation and a statement of interest to be considered. It would behoove applicants to mention any experience in or passion for public service in the statement of interest.